“Murphy Brown”, “Will & Grace, “Magnum P.I.”? No thanks. 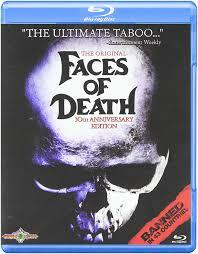 Let’s bring back “Faces Of Death”! Faces of Death (also released more recently as The Original Faces of Death) is a 1978 American mondo horror film directed by Conan LeCilaire and written by Alan Black. The film guides viewers through graphic scenes depicting a variety of ways to die and violent acts.